Muhammad-Ali Abdur-Rahkman #12 of the Michigan Wolverines is defended by Tyler Davis #34 of the Texas A&M Aggies in the NCAA Men's Basketball Tournament Thursday night. No. 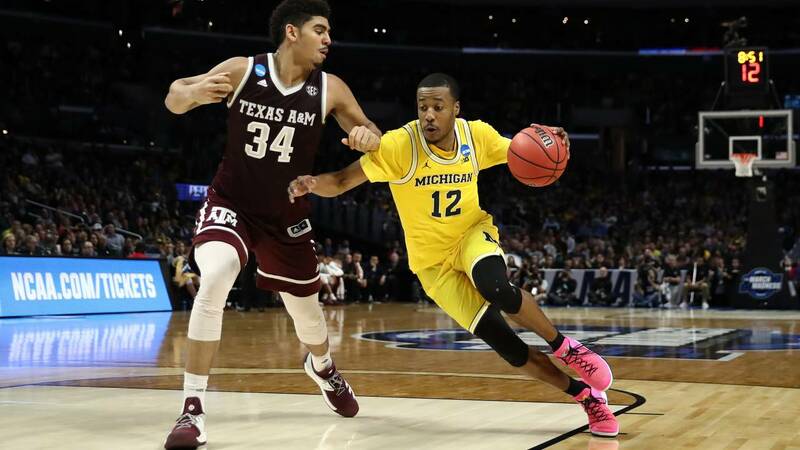 3 Michigan dispatched Texas A&M 99-72 Thursday night to move into the Elite Eight of the NCAA College Basketball Tournament. Muhammad Ali Abdur-Rahkman led the Wolverines with 24 points. Moritz Wanger also had 21 points for Michigan. The seventh-seeded Aggies had convincingly dispatched defending national champion North Carolina 86-65 in the second round of the West Region on Sunday. The Aggies (22-13) have shown what their size can do on their way to their second Sweet 16 in three seasons. Junior center Tyler Davis and sophomore forward Robert Williams each turned in double-doubles to go along with two blocked shots each in the Aggies' 73-69 first-round victory over Providence and then dominated the glass once again in upsetting the Tar Heels. The Aggies have now reached the Sweet 16 six times in program history, but were seeking their first Elite Eight appearance. Michigan (31-7) rode sophomore guard Charles Matthews' double-double of 20 points and 11 rebounds to first rally and then blow out Montana 61-47 in the first round and then beat No. 6 Houston on freshman Jordan Poole's 3-point buzzer-beater on Saturday. The Wolverines tied for fourth in the Big Ten regular season standings before storming through the conference tournament for the second year in a row. Michigan played in its second straight Sweet 16 and 15th overall, although the school's runner-up performances in 1992 and 1993 were vacated due to NCAA violations. The win gave the Wolverines their first Elite Eight berth since back-to-back appearances in 2013 and 2014 as they try to win only their second title after 1989's championship season. MIchigan will take on No. 9 Florida State on Saturday for a spot in the Final Four.